Warner Archive Collection brings another favorite from the Warner Bros. Animation canon to Blu-ray with the January 23, 2018, release of Teen Titans: The Complete First Season. In these 13 action-packed adventures, the Titans face all your favorite villains – Mad Mod, The Puppet King, Killer Moth and, of course, their arch-nemesis Slade – in one power-packing showdown after another. Some battles even pit the Titans against each other. Featuring bold animation, funky music and fun characters, this complete Season One from the hit TV series is an intergalactic knockout. The renowned Teen Titans core cast features Khary Payton (Cyborg), Tara Strong (Raven), Scott Menville (Robin), Greg Cipes (Beast Boy) and Hynden Walch (Starfire). Guest voices line up like a Murderer’s Row of celebrity actors, led by the ever-present Ron Perlman as Slade. 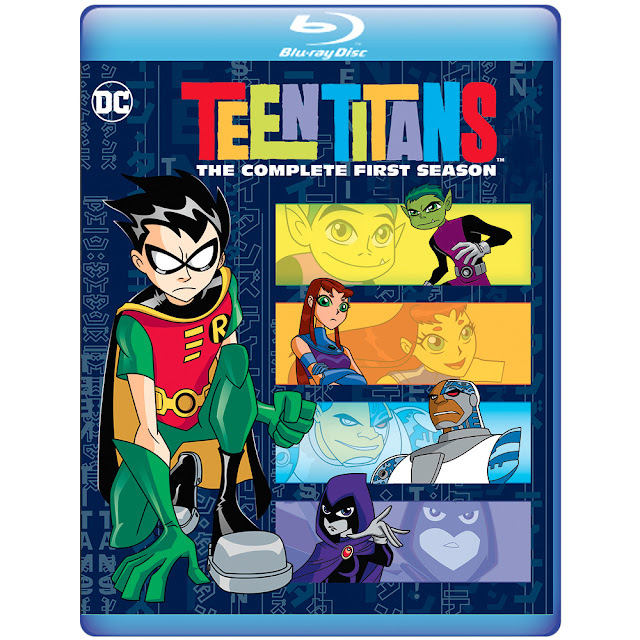 Also featured in Teen Titans: The Complete First Season are Malcolm McDowell (Mad Mod), Clancy Brown (Trident), Wil Wheaton (Aqualad), Dave Coulier (Captain, Tramm), James Arnold Taylor (Overload, Cash), Kevin Michael Richardson (Mammoth), Rino Romano (Kai), David Sobolov (Cron), Dee Bradley Baker (Cinderblock, Plasmus), S. Scott Bullock (Thunder), Quinton Flynn (Lightning), Tom Kenny (Mumbo, Fixit), Roger Bumpass (Dr. Light), Keith Szarabajka (Trigon), Tracey Walter (Puppet King) and Lauren Tom (Gizmo). Produced by Glen Murakami, Teen Titans: The Complete First Season features direction by Michael Chang, Alex Soto and Ciro Nieli, and scripts from Rob Hoegee, Amy Wolfram, David Slack, Adam Beechen, Greg Klein, Tom Pugsley, Rick Copp and Teen Titans guru himself, Marv Wolfman. Executive Producers are Sam Register and Sander Schwartz. Associate producer is Kimberly Smith. Producers are Bruce Timm and Linda Steiner. Animated blu-ray DC Comics DC Entertainment DVD Teen Titans video Warner Bros.
Labels: Animated blu-ray DC Comics DC Entertainment DVD Teen Titans video Warner Bros.